To celebrate the milestone of turning 150, Jack Daniel’s is going back to its Southern roots. 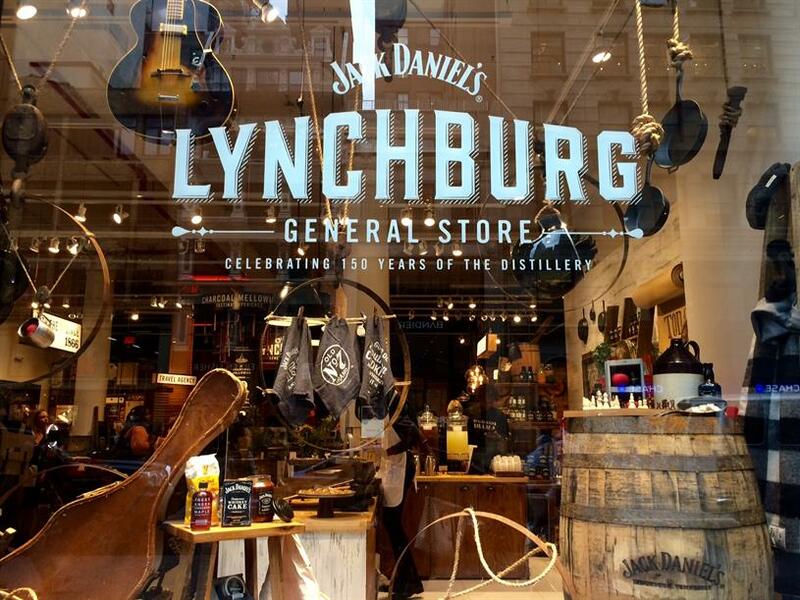 The Tennessee whiskey brand has opened up the "Jack Daniel’s Lynchburg General Store," a pop-up shop in Manhattan that mimics the brand’s original general store and distillery in Lynchburg, Tennessee. Located at 155 Fifth Avenue in the flatiron district of Manhattan, the pop-up debuted on September 19, and is open until Saturday. Campaign US went to check out the celebration. 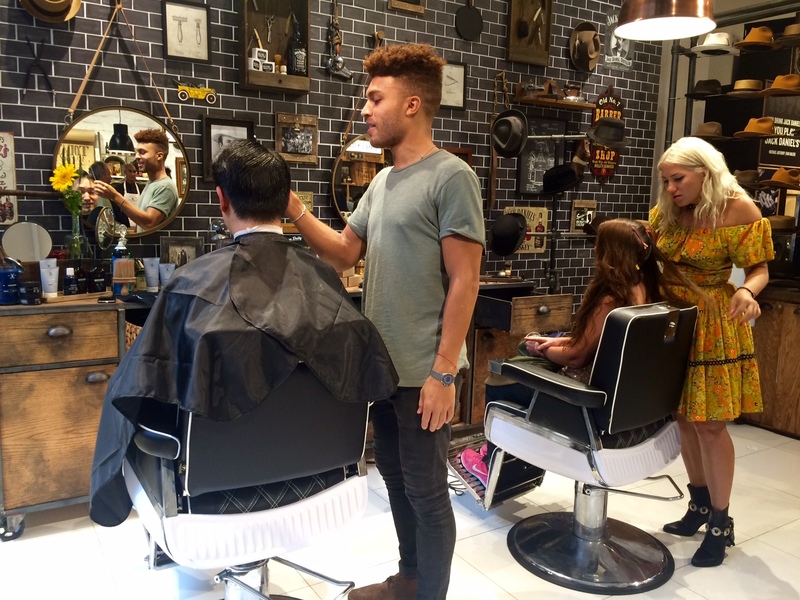 From a barber shop to a virtual reality tour, the brand worked with creative agency Mirrorball to create experiences for the week-long pop-up. According to Laura Magill, Mirrorball account director for Jack Daniels, the theme of a general store and these experiences are meant to bring consumers closer to the home and history of the aged brand. "The brand always said that if you bring someone to Lynchburg, they’ll be a Jack Daniels fan for life," she said. "We wanted to bring that to the different markets so everyone can experience Lynchburg within their own towns." The shop harkens back to 1866 when the brand was born and, at the same time, stays in the present. For instance, inside the store is an old-time barber shop, Bowler hats for sale and demonstrations on how to build barrels. But there is also a virtual reality station that gives viewers a tour of the Lynchburg distillery. Then there’s a music-themed area to pose with 70's memorabilia and post your photo to Instagram. The event is using the hashtags #JDGeneralStore and #Jacks150. Despite the tech at the event, Magill insists that Jack Daniel’s branding has stayed consistent. "One of the things Jack prides itself on is that it is the same brand that they were 150 years ago," said Magill. "The ideology has been to stay true to the brand." The General Store will display the brand’s treasured objects from the decades, including a Gold Medal won at the 1904 World’s Fair and the safe that Jack Daniel famously kicked. The incident led to his death in 1911. Throughout the week, guests will also be treated to free gifts, snacks and music. "We are focusing on elements of the Jack Daniels’ story that are the most important to the brand," said Magill. Naturally, the whiskey takes center stage. 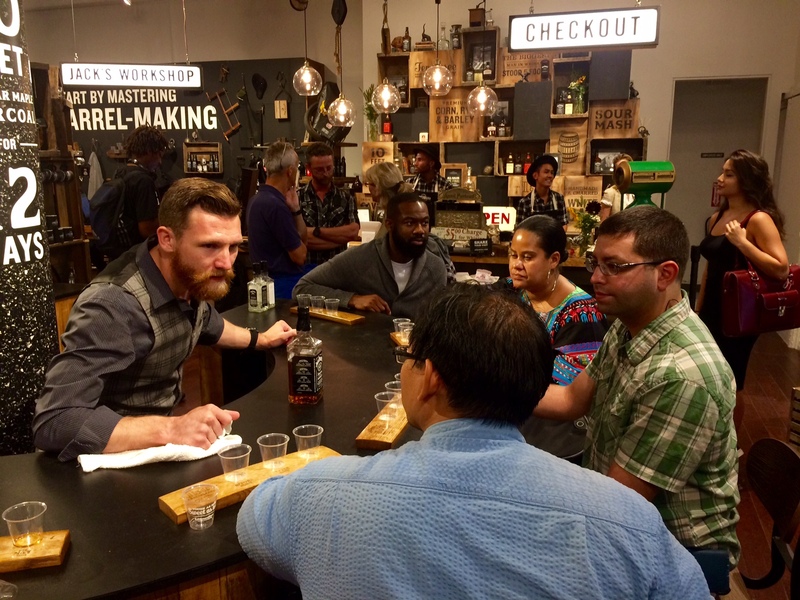 In the middle of the shop is a bar where charcoal whisky mellow tastings take place every fifteen minutes. Between three shots of Jack Daniel’s whiskey, the bartender teaches about the long process the whiskey goes through to make it to the bottle. 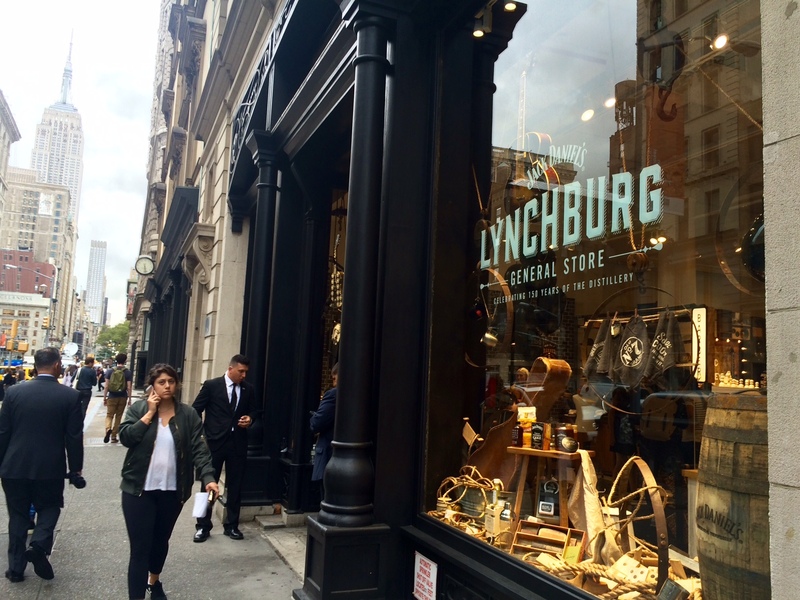 Jack Daniel’s is the latest brand to jump on the pop-up store trend. Most recently, Amazon has put out its own small pop-up stores in malls. And brands like U by Kotex, Etsy, Kate Spade and Indochino have also resorted to brick-and-mortars. "It gives us the opportunity to reach as many people as we possibly can," said Magill. "We have chosen a high-traffic area so that we can get that foot traffic." But the pop-up store began with a hiccup. The opening had to be postponed for a day due to the bombings in the area last weekend. The shop is open from 11 am to 7 pm. After Saturday, the shop will travel to Chicago from October 16-22 and then Miami from November 13-19.